Homelessness in Los Angeles, is on a civic track for progress. There are two propositions schedule for the November elections, if passed these propositions will create housing for LA’s 12% and employment for residents in Los Angeles County. 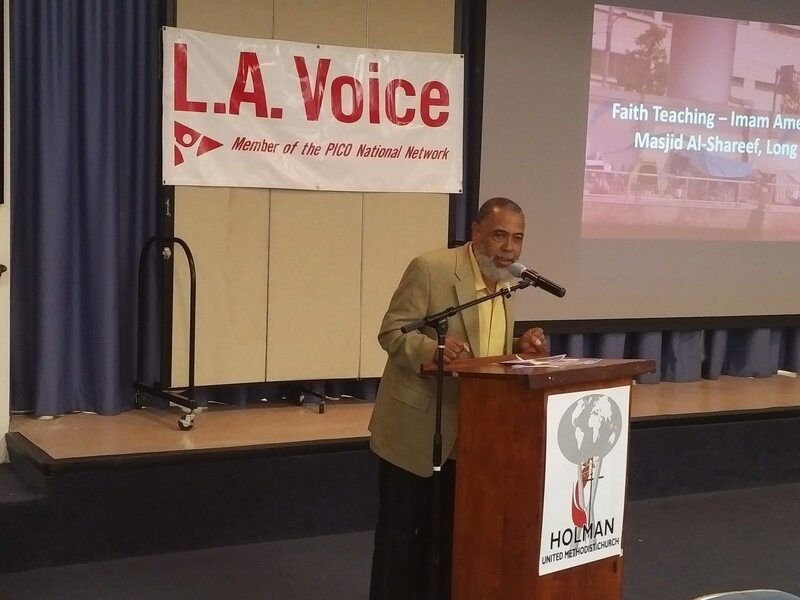 On Wednesday October 19, 2016 organizer LA Voice PICO invited co-sponsors; Religious Action Center of Reform Judaism (RAC) and the ILM (Intellect-Love-Mercy) Foundation, to hold a summit at Holman Church. This summit supports Props HHH – housing for the homeless and JJJ – a job generator. Both are important props that furthers the City of Los Angeles agenda for social responsibility and progress to engage homelessness. Imam Ameen Omar of Masjid Al Shareef, shared an universal message for neighborly needs. Rabbis Joel Simonds (RAC) spoke about Jewish his community’s efforts. The power of story-telling empowered these transformative stories, leaving a lasting impression for change over Los Angeles pious leadership. The ILM Foundation and its efforts with Humanitarian Day, encourages U.S. citizens to exercise our rights to vote and help to create a more sustainable future. Please read and complete the entire ballot, for these props are located in its back pages. The RAC of Reform Judaism is the social justice arm of the Reform Jewish movement. We represent over 1.5 million Reform Jews, 900 congregations of the Union for Reform Judaism and over 2200 Reform Rabbis of the Central Conference of American Rabbis. The RAC educates and mobilizes the Reform Jewish community on legislative and social concerns that reflect the Jewish values of social justice that form the core of our mandate. LA Voice we believe all people have power and a voice. Every day we transform LA County into a place that reflects the dignity of all people, with racial and economic equity and abundant life for all. We are a multi-racial, interfaith federation of 51 member and partner congregations and organizations spanning all five supervisorial districts and more than half of LA City’s council districts representing 50,000 families. We are currently in the midst of our largest non-partisan voter engagement campaign ever, helping congregations to become 100% Voting Congregations. As of this morning, our congregations and team have had conversations with 13,811 voters in LA County, most of whom are people of color. We have identified 9251 voters who have pledged to support Props 55 – 57, JJJ, and HHH. And we still have 20 days to go! 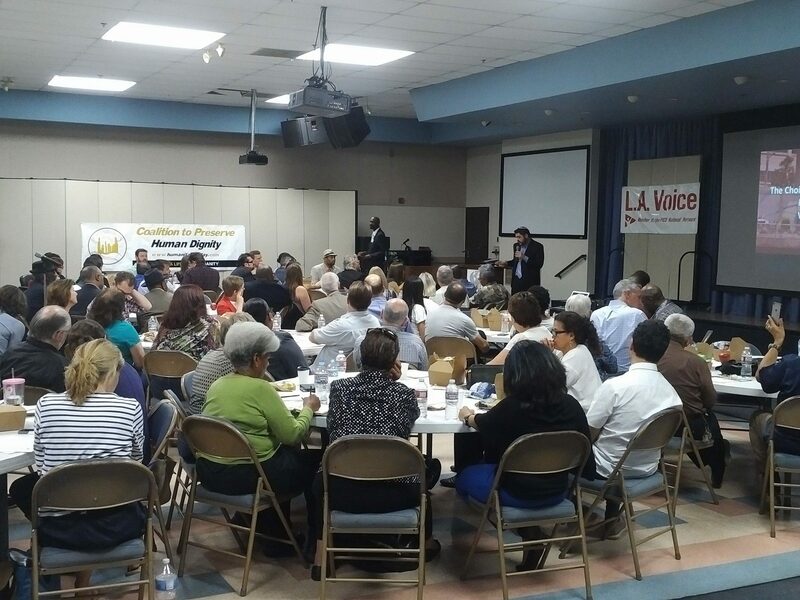 LA Voice is part of PICO California, the largest faith based grassroots organization in the state covering all regions of California. Our Together We Vote campaign will reach 249,200 voters in California as part of the Million Voters Project combined effort to reach 652,120 voters. Goal 11: Successfully coordinate organizing campaigns with community partner LA Voice.